Truck and delivery drivers are experienced at driving in all sorts of conditions, but when a storm hits, there is risk of massive delays. Using a weather data feed will allow a company to analyze how past inclement weather, such as a thunderstorm or hail, impacted your previous delivery times. This analysis allows you to be proactive by using GPS tracking and the local weather forecast data to automatically suggest different routes if hazardous weather is on the way. Public transit use tends to increase during poor weather. If you aren’t proactive and ensure enough vehicles are running to accommodate increased ridership, you run the risk of cramped transit users tweeting out complaints about service. Running historical analysis of rider patterns during different weather events will allow you to better plan for optimizing the network in the future. By considering the weather forecast in combination with other ridership factors, you can decide how to best optimize your resources for the week ahead. When there are planned closures in addition to a storm on the way, you can better plan to keep the flow of people moving and satisfied. It’s common for people to “forget how to drive” when it’s raining out. For those responsible for the safety of drivers and keeping people moving on the highway, you can use weather data to predict the likelihood of an accident or of car breakdowns to be better prepared to respond to emergencies. Forecast data can be used to trigger alerts on digital signs along the highways to warn drivers of impending weather conditions. Keeping track of how weather affected portions of the highway can also help you keep up with the likelihood of new potholes, and allow you to perform preventative maintenance. 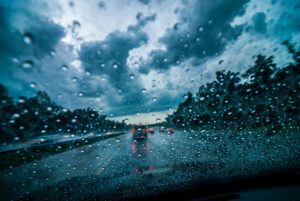 If transportation is a large part of your business and you want to start performing weather-based analytics, learn more about implementing weather into your analytics framework by owning a weather data feed.